UCFaster: The most notable change was the speed of the offense. Last season, the team averaged around 71 plays per game. During the spring game, the team ran 108, and that wasn’t even the fastest they could go. Coach Heupel said they had a set number of plays they wanted to run with each group and went to a running clock in the second half to limit them from running too many plays. Offense is still rolling: There didn’t seem to be a shortage of targets for the quarterbacks, as the 29 completions were spread amongst 15 receivers. This even distribution is something star quarterback McKenzie Milton thinks will continue into next year. Sophomore Jaquarius Bargnare led the team with four catches and 52 yards. Senior Tristan Payton, who struggled in his first couple years at receiver before switching to defensive back last year, had 2 catches for 45 yards, including an impressive 37-yard touchdown from Milton. Top returning receiver Dredrick Snelson had 42 yards on three catches. The running back group featured a few surprises. The top rushers from last season did not see much action as Adrian Killins did not record a single carry, and Anderson, who spent most of the last open practice with the receivers, only had three carries. He did have five catches for 39 yards and touchdown however. The most impressive performance came from walk-on running back Greg McCrae. He used his quickness to force several missed tackles and even ran over safety Richie Grant. He totaled 57 yards and two touchdowns on 15 carries. 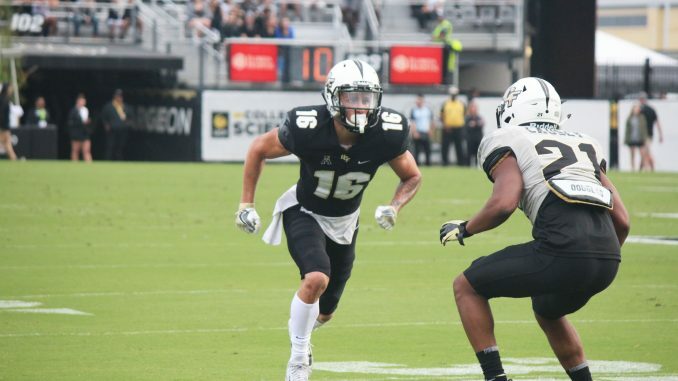 Milton is coming off one of the most successful statistical seasons in UCF history and it looks like he will take another step forward this year. He finished the game completing 14 of his 21 passes for 183 yards, two touchdowns and one interception. He led three of the four scoring drives. His passes looked a lot sharper and were being thrown a lot harder than they were last season. He credited this to the work he’s put into his footwork this offseason. He didn’t run as much in this game. His playmaking from inside the pocket is something that he and Coach Heupel wanted to work on. Milton’s one interception was a result of a forced throw, but for the most part, he played a clean game. Darriel Mack Jr. finished the game 12 of 19 for 89 yards and four yards rushing on seven carries. He mostly hit short passes and seemed to have some miscommunications with his receivers. All his series ended in punts. Hayden Kingston finished the game 3 for 7 for 33 yards and had 11 rushing yards on seven carries. He led the fourth UCF scoring drive. He was quiet through the air but had a few nice scrambles. Defense still has room to grow: Like the offense, the defense also lost a few key contributors. In its first game under Randy Shannon’s new scheme, the unit played well, but had a few lapses, mostly in the secondary. The secondary got beat a few times by Milton, most notably for the 37-yard pass to Tristan Payton. They also got called for a few pass interference penalties. They gave up a total of 305 passing yards and two touchdowns, but also had an interception. They could have given up more, as a few balls that could have resulted in a touchdown or big gain were miss thrown. On the flip side, they could have had a couple more interceptions, but couldn’t quite make the play. The front seven looked like the stronger unit. They gave up 3.5 yards per carry, while amassing nine sacks and 15 tackles for loss. Though those number were boosted, however, by plays that were quickly blown dead by the refs. The defense was led by Nat Evans who had 10 tackles, 2.5 for loss and a sack.